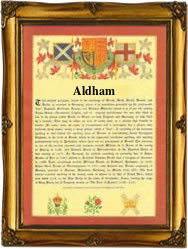 This name, with variant spellings Aldham and Aldam, is of Anglo-Saxon origin, and is locational from either Aldham in Essex, or from Aldham in Suffolk. Recorded variously as "Aldeham" and "Ealdham" in the Domesday Book of 1086 for the above counties, the placenames are derived from the Olde English pre 7th Century "ald" or "eald", meaning "old", plus "ham", an estate, manor or homestead; hence, "the old manor or homestead". Locational surnames, such as this, were usually acquired by a local landowner, or by the lord of the manor, and especially by those former inhabitants of a place who had moved to another area, usually in search of work, and were thereafter best identified by the name of their birthplace. The surname is first recorded in the early 13th Century (see below). Recordings from English Church Registers include: the christening of Ann, daughter of Henry Aldham, on April 12th 1566, in St. Mary at the Quay, Ipswich, Suffolk; the marriage of William Aldham and Elizabeth Wythe on September 26th 1587, in Helmingham, Suffolk; and the christening of Joane, daughter of Richard Aldham, on February 27th 1613, in Essex. The first recorded spelling of the family name is shown to be that of Achard de Aldeham, which was dated 1218, witness in the "Fine Court Rolls of Kent", during the reign of King Henry 111, known as "The Frenchman", 1216 - 1272. Surnames became necessary when governments introduced personal taxation. In England this was known as Poll Tax. Throughout the centuries, surnames in every country have continued to "develop" often leading to astonishing variants of the original spelling.